Here is a paper and breakdown for your notes and education. 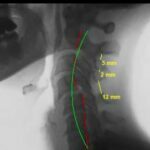 The authors looked at multiple criteria on what is needed to properly evaluate instability in the cervical spine. The authors did not mention C1/2 translation, but I have a paper on that topic coming out soon. Be sure to do a FULL examination, and history as well as MEASURE your X-rays. Educating our patients on their condition and explaining how we can help is the most important aspect. I also have a paper coming out on DMX and instability that covers more than just . . .